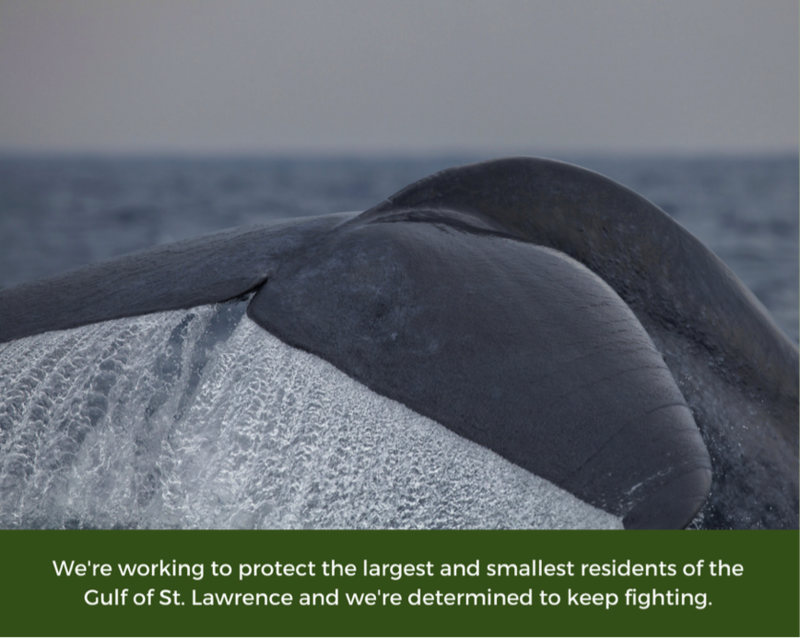 I wanted to give you an update on our critical legal battle and appearance in court this week to protect the Gulf of St. Lawrence and all of the beautiful creatures who live there. The case involves one important argument: the issuance of the licence that the offshore board has granted to the oil company, Corridor Resources. First though, we had to defend our ability to be heard, as “our standing,” is being challenged by the offshore board (responsible for granting exploration licences to oil companies), and by the oil company itself. Yesterday afternoon, the judge evaluating our standing to protect the Gulf of St. Lawrence finished hearing our arguments and those who opposed our right to be heard, the offshore petroleum board (CNLOPB) and oil company Corridor Resources. It’s been a long couple days and every word spoken could have significance, so it’s hard to pick highlights. The offshore board seems to be arguing that this is not a serious issue to us, because it’s a licencing decision which, in their opinion, affects only industry. Corridor Resources, who has been granted the license we are contesting in the Gulf, is echoing the Board's arguments, and saying since no one in industry brought the case, it’s not worth hearing. Of course, this a very serious issue that deeply impacts all of us and the groups dedicated to protecting the Gulf. Exploration at the Old Harry prospect in the Gulf has the potential to impact endangered whales and thousands of other creatures who live in the Gulf. Oil spilled at Old Harry - which is 7 times smaller than the Gulf of Mexico - could mar the coastlines of five provinces. And the decision to extend licences beyond their intended term could affect management in thousands of hectares of oceans off NL, NS and our Arctic. Seeing the head of the offshore board cross-examined by our lawyers as to why he felt the groups he had been corresponding, meeting, and consulting with for the past nine years did not have an "interest" in this case gave rise to some revealing moments. Such as when the CEO acknowledged his own letter to the Coalition St. Laurent, in which he refers in his own words to our "interest" in matters relating to the licence. A lesson there to anyone who feels the letters you send to officials don’t matter. Shockingly - in light of our country’s commitment to reconciliation - some of the longest arguments made by Corridor and the Board were to oppose the standing of the Innu-Malaseet-Mi'kmaq Alliance which is requesting to intervene in the case. Since the NL government is also intervening, uncontested, in support of the Board's decision, why would indigenous communities not also be heard? Although the stakes are high and nerves were tense, it was also such a relief to be present as the court deliberately and carefully evaluated the arguments of all parties. After years of fighting for the Gulf against a board that has turned a deaf ear to our arguments, and made decisions in secret, it was so gratifying to see a judge carefully consider our arguments in open court. What are those arguments? Our lawyers from Ecojustice argued skillfully that we meet the criteria for public interest standing, which is we bring a serious legal issue before the court, we have shown a genuine interest through our history of engagement on the issue at hand, and that our case is a reasonable and effective way to bring this important issue before the court. Our lawyers also argued that we really will not have a better situation to argue this case, as all the parties who could play a role (the offshore regulator, indigenous groups, industry, government, and public interest groups) are present to argue their perspectives. I had really hoped a decision would be made this week and, if our request to be heard was granted, we could proceed quickly to make our arguments against the Board's decision to keep Corridor's stake in the Gulf. But this was not to be. Legal challenges can result in huge victories. It’s decision making at the highest levels. But they involve many phases over many months and even many years. So for this moment, our patience is required speculating on the judge's deliberations and possible outcomes. Not the quick result I had wished for - for the Gulf and for all those working to protect it, but we’re hopeful for an early holiday gift.